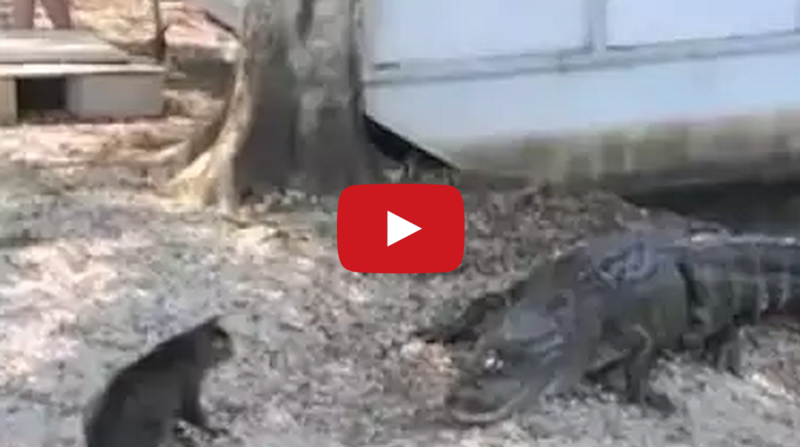 Cat Saves Boy From Two Vicious Gators – Cat vs. Gators. Some people get squirrels or rabbits in their backyard. However, it looks like these unlucky people have a gator problem in their backyard! When two hungry, vicious alligators emerge from the Bayou Swamp, Mugsy the cat leeps into action to protect a boy from being their lunch. Brave Mugsy left with all her limbs in tact and told those gators who’s boss. Check out the video below. You have to see it to believe it! Scary! Can You See The Spooky Faces In These Facebook Photos? We Sure Did!